* If you prefer, you can see a .pdf version here (1.61 Mb). The last few months have been eventful for us. Here is a quick update on our life and ministry in Japan. God continues to work at SIBC, though honestly, it is a little hard to know exactly what He is up to. In recent newsletters we have mentioned the financial struggles that the church has been facing for the last couple of years. On top of that, we have also seen a noticeable decline in the size of the church family. Some long-time friends have recently moved on, leaving even fewer people to support and maintain the current life of the church. While this might seem like a cause for concern, we really have the sense that this is all a part of God’s plan for us. As is says in 1 Corinthians 12:18, “But in fact God has arranged the parts of the body, everyone of them, just as He wanted them to be.” We believe that God is currently “re-arranging” his body at SIBC in order to prepare us for the new season ahead. Specifically, we will most likely have to vacate our current facility by the middle of 2012. This will not only mean a change in WHERE we meet, but also in HOW we meet. For the last few years now, the Lord has been teaching us the difference between “doing” church and “being” the church. More than just having a nice worship service on Sunday mornings, there is a growing hunger in our hearts to genuinely encounter Jesus during our times of worship. More and more, we want to learn how to look to Jesus, listen to Jesus, worship Jesus and obey Jesus. On top of that, we desire to discover authentic body life. When we gather together, we want to do the “one anothers” to one another (serve one another, teach one another, encourage one another, pray for one another, etc…). With this in mind, is it possible that the Lord is using this current building situation to gently nudge us out of our comfort zone and safety of our familiar routine? PLEASE PRAY that we (the entire church family) would clearly hear from the Lord during this important time. May we have the courage and the faith to follow our Shepherd wherever He might lead. In October, our whole family went with Be One down to Wakayama Prefecture do relief work in the aftermath of a devastating typhoon that went through the area. We spent the day helping to clean out an old school that was submerged in 7 feet of water when the nearby river overflowed it's bank. It was a fun day of hard work and fellowship, and we are thankful for the opportunity to serve those in need. In the last month, Michael has had the opportunity to do two funerals. In late October, the grandmother of a church member passed away. About a month earlier she confessed her faith in Jesus and we had the privileged of baptizing her in the hospital. A few weeks later, a church member also passed away. He became a Christian soon after we arrived in Japan and, at 81 years old, had long been the eldest member of SIBC. While it is always hard to say goodbye to those we love, there is also a deep joy in knowing that they are with the Lord. Praise God that Jesus is the resurrection and the life. 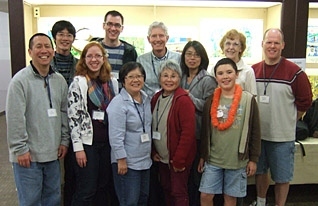 In mid-November, all of the JEMS missionaries in Japan (9 in total) met together for our first-ever gathering in Japan. JEMS executive director Rick Chuman came from the States to host the event. It was a wonderful time to connect with our fellow co-workers and hear about their various ministries. 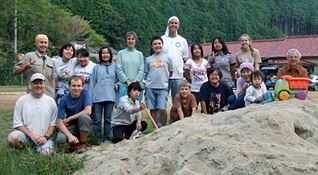 PLEASE PRAY for all of the JEMS missionaries serving in Japan. For the last few months, Chris had been contemplating getting a part time job. This would not only compensate for the ever-declining dollar/yen exchange rate, but would also provide opportunity for Chris to do ministry outside of the church. 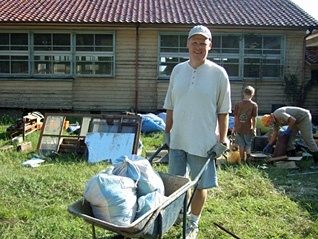 Well, in November, God unexpectedly opened a door for Christ to work as a teacher's aid at Kansai Christian School. Chris works 4 days a week (for a total of 10 hours), mostly helping out in the 1st-2nd-grade classroom. PLEASE PRAY for Chris as she starts this new job. May she be a blessing to the school as she serves both students and staff. Pray also for physical strength, as she was really tired after her first week on the job. On the home front, we would like to ask you to pray for Chris' mother. She has recently been experiencing a variety of health issues that is causing Chris to be concerned. However, the good news is that last weekend some Christian friends stopped by to see Chris' mom and her mom prayed to receive Christ! After Chris' father became a Christian a few years ago, her mother began attending church, but always seemed a little disinterested. However, God was clearly at work, and now she has finally become His child. So, PLEASE PRAY for her mother's new-found faith in Jesus. Pray also for her physical health. Given these developments, Chris and Luke have decided to make a quick trip to America over Christmas to check on her parents. PLEASE PRAY for them as they travel and also for Michael as he will spend Christmas and New Year without them. Well, that is about it for now. Thank you for all of your prayers and support in 2011. May the joy of our Savior fill your heart as we enter this Christmas season.